Now that you have understood the importance of rare earth elements (REE) via the previous article titled Of Rare Earth and Lynas - Part I, it is now about time to learn (if you haven't already read) about what is in there for us at Lynas Advance Material Plant (LAMP) in Gebeng, Pahang. 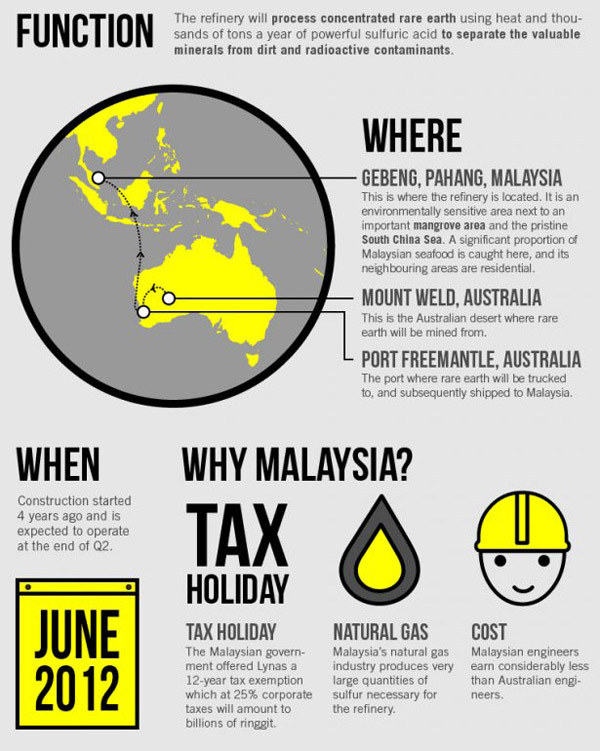 The following is the info-graphics compiled by IM Magazine and it summarised many facts you need to know about the controversial refinery. You can visit them here and you are encouraged to share the infographic with your friends and family. IM Magazine: "Love Malaysia? Then don't forget to share it with your friends and family." 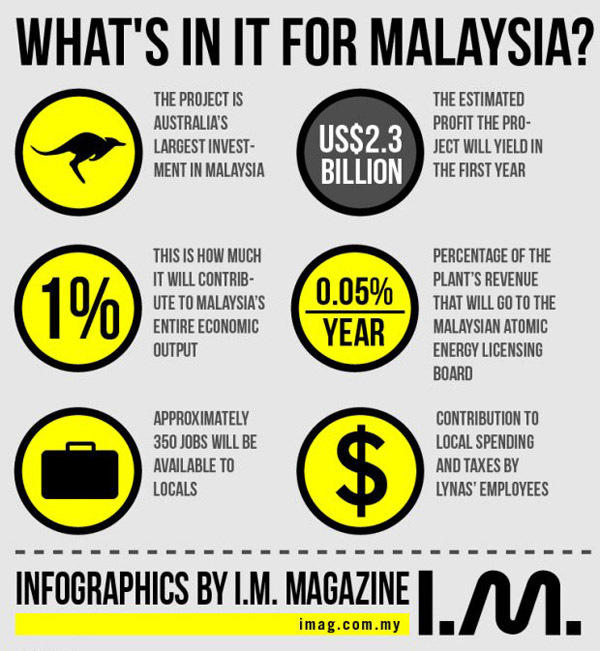 There is an on-going discussion in the infographic thread provided by IM Magazine and some voiced their concern regarding the facts and figures provided by IM. If in doubt, readers are advised to read the articles and sources quoted by the author. Waste site to be 'far away from plant'? Prime Minister Datuk Najib told reporters after a meet-the-people session at Wakaf Mek Zainab in Kota Baru last week: “The location of the waste disposal site is still being determined, but it is going to be far away. Scientific evidence endorsed by local and international experts shows that the plant and rare earth residue are safe." 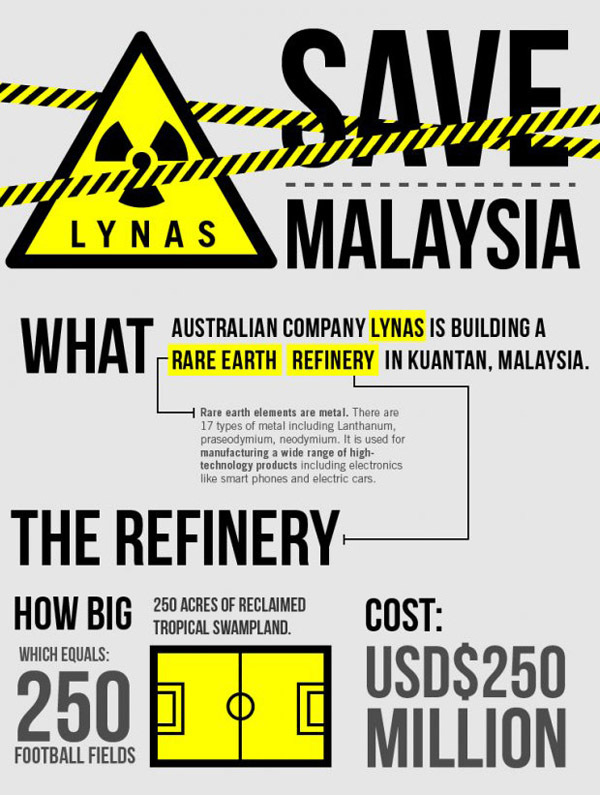 In Malaysia there is nowhere and no place that is far enough for Lynas rare earth refinery waste. No one from Johor or Kedah, or Sabah for that matter, would want to 'receive' radioactive waste in their neighbourhood. AND make no mistake, for all of Lynas' undertakings to ship the waste out of Malaysia, don't dream of sending it back to Australia. 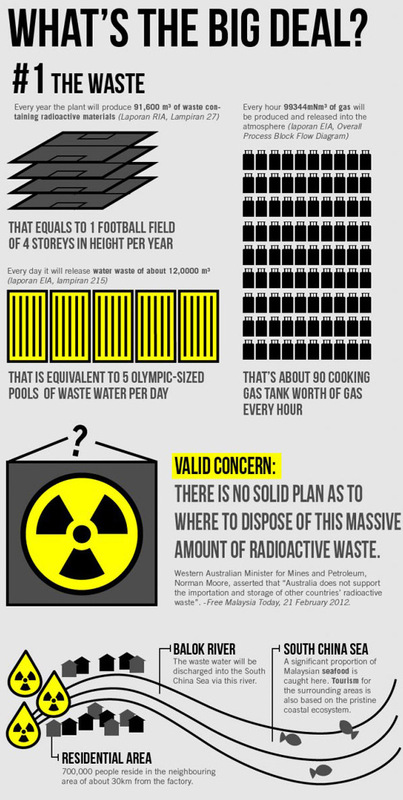 Remember what Norman Moore, the Western Australian minister asserted "Australia does not support the importation and storage of other countries’ radioactive waste." SEPA - Remember Bukit Merah! SEPA President, Wong Tack on Tuesday (Daily Express, 6 March 2012) brought us back down memory lane to the painful experience of Bukit Merah rare earth refinery operated by Mitsubishi in the 80s during ex-PM Dr Mahathir Mohamad era. “After 10 years of operation, an unusually high number of children in a nearby village were born with birth defects and brought down by leukemia” Wong noted. The government closed the plant in 1992 after many years of protest by a Citizens Group, a group formed to protest the campaign for shut down of the plant. It is believed that today, former Mitsubishi rare earth plant site in Bukit Merah still stores 80,000 drums containing 200litres each of deadly radioactive wastes and it remains out of bounds - [SEPA]. 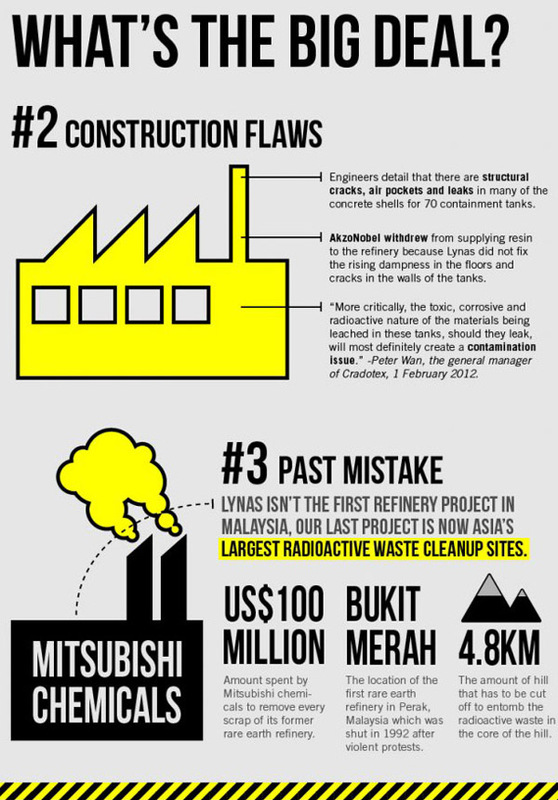 If we look back at the above infographic, Mitsubishi Chemicals spent US$100 million to clean up the mess in Bukit Merah. Think about this. If Australians did not have to endure radioactive radiations from a supposedly Lynas plant back there, why would us Malaysians want to willingly subject our self to a highly risky endeavour? Lynas based their analysis and reports on 100% plant process efficiency. In real world, due partly to human error and mostly to man's carelessness or just plain ignorant. It can happen even in the most stringent environment. Murphy's Law states that "If it can go wrong, it will". In other words, Lynas is an accident waiting to happen. If it goes wrong it will never be reversible. Coal-fired power plant in Lahad Datu has been cancelled after consistent protest from the local population, as well as friends and fellow Malaysians from Peninsula. There is no stopping the people of Gebeng from asking for their right to live safely and healthily. Your flashy Gadget or no Lynas? Rare earth elements are important and they are needed for many of the modern gadgets and appliances, yes. But there are other places that are less inhabited that we can process them there. It will then be more costly but that is the price we'll have to pay for modernisation. If we can do it far away from the masses, why put our self in danger? Why Gebeng? i will put all the blame solely on our International Trade and Industry Minister for this big blunder.